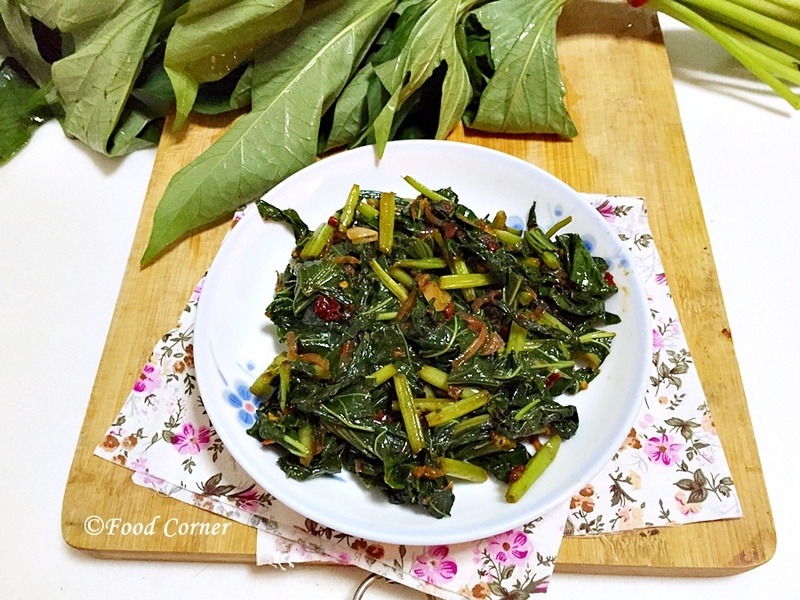 Sweet Potato Leaves Stir Fry won my heart and I want to share the recipe today. 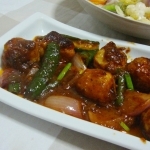 This is a Sri Lankan style recipe which I tried few months ago. 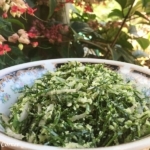 Here in Singapore, we can see lot of different green leaves, so I try those in our Sri Lankan recipes and most of the time those are successful. 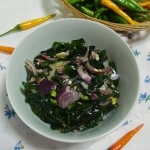 When we bought Sweet Potato leaves, I thought it is good for stir fry recipe than a Kola Mallung. 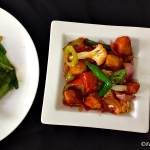 My decision is correct and if you like the popular Chinese kankun stir fry, then you’ll love this dish too. If you noticed, I missed updating Food Corner. But I still love Food Corner and the community around it. Emails, admiration and comments make me happy and inspiring. But, as for any other mom, family is important for me too. These days I take care of my toddler full time and give much more attention for him. As he is more active than before, I done get much time to experiment food photography, so I always left with photos which I actually don’t want to share. Finally I decided to continue updating Food Corner with the photos I take at night, with phone or while running after my son. As long as information is there, that will be worth than never updating. Sweet potatoes or Bathala Kola as we call it in Sri Lanka is easily available in Sri Lanka or in most other countries. So, try my recipe and let me know how it turns out for you. Wash sweet potato leaves properly. Remove the stems which are mature or hard. Cut it coarsely and set aside to drain excess water. Slice onion, chop garlic and keep aside. Now it is time to cook! Heat up cooking oil in a wok, when it is hot, add mustard seeds. When mustard seeds start to pop out, add garlic and onion. 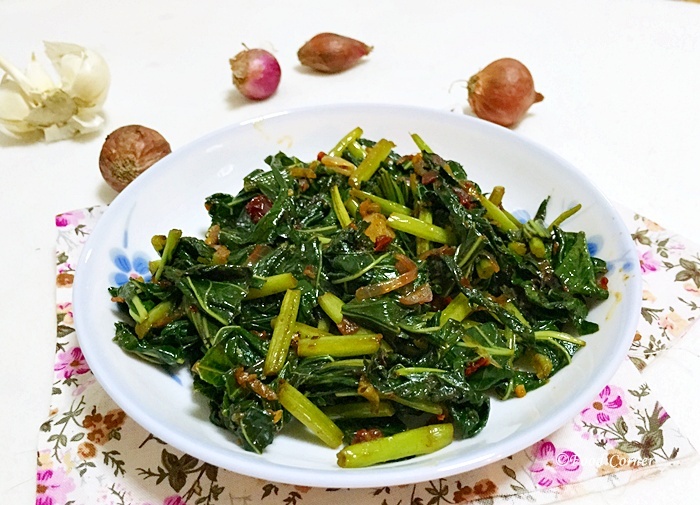 Mix well and Stir and fry till onions and garlic start emitting aroma. At this stage, add chili paste and mix well. Stir the mix and add chili flakes and turmeric powder. Then add all the leaves which we kept aside and mix well. Adjust salt and remove from the stove. Actually the heat of the pan is really enough for cooking sweet potato leaves without changing the colour much. 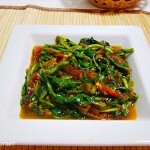 Sweet Potato Leaves Stir Fry is ready! 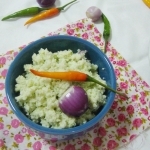 Serve with plain rice or even with fried rice. This is very new to me, Amila. Didn’t know bathala kola was edible ! This looks very tasty and look like kankun. If I’ll ever be able find some bathala kola from here, I will definitely try your recipe. Thanks for sharing. 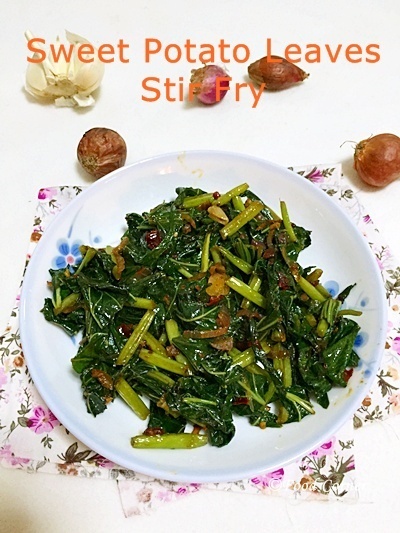 Yes,try it.It really tastes as a stir fry.But it is not good with our typical mallun recipe. 🙂 I tried the both ways. It looks delicious, once i tried to make it as mallum. As u mentioned, the taste was not good, so didn’t try otherways. Need to try your method. I’ve never tried the leaves that grow on sweet potato plants, but I would very much like to try them. Since I like most types of greens. Hi Amila, I didn’t know that bathala leaves could be cooked. Yr recipe seems to be tasty. Surely, I am going to try it.